It may be the most stressful time of the year, but it’s also one of the jolliest times to job search. Kick-start your job search by spreading some cheer. Sure, the holiday season is a great time to take time off work, bake cookies, and watch Elf and Miracle on 34th Street on repeat. But it’s also the perfect time to put on your party face for a different reason—looking for a new job in the new year. For some companies, it’s true that hiring slows in November and December—it’s the end of the fiscal year and most of a company’s budget has been spent; people are on vacation, and teams are working to hit their yearly goals. Monster spoke to experts to find out their top tips for spreading cheer in hopes of finding the best present ever (a new job). There are so many networking opportunities in December, the hardest part is choosing which are naughty and which are nice. In other words, which events are worth your time during the busiest time of year? “The key thing is to go to as many as you can that will attract a ‘good’ group of attendees,” says Alyssa Gelbard, president and founder of Resume Strategists, a New York City-based career consulting and personal branding firm. "Good" does not mean your friends. Good means people more senior to you who have knowledge, networks and more established careers. Use that time to rub ugly sweater–festooned elbows with people who may be able to help you find your next job. Check organization websites to find out whether your favorite companies, industry associations, alumni associations, charities and networking groups are hosting events. Then check social media to see who has RSVP’d to the events, and you’ll get an idea of where you should make an appearance. Chances are, you’ve got networking opportunities on your calendar already—with your relatives and their nearest and dearest. Family holiday parties are a great way to work your closest connections, asking questions you might not feel comfortable posing to a stranger. That in-person holiday face time could go a long way toward helping you find a new job. Even at professional networking events, people don’t only want to talk about work over eggnog and holiday cookies. So branch out from your usual networking chit-chat. Deena Baikowitz, co-founder of Fireball Network, a New York City-based coaching and consulting firm, recommends skipping the basic questions in favor of unexpected, fun questions that will spur festive yet still informative conversation. What was your best holiday vacation? Does your office have any fun holiday traditions? What are your family’s favorite holiday traditions? What’s the quirkiest gift you ever got for the holidays? These questions will lead to a memorable, friendly conversation. You can connect to ask more career-focused questions after the holidays. Want a fabulous way to network during the holiday season? Create one! Help people get to know each other at a secret Santa exchange, gingerbread-decorating party or other holiday-themed events you host. Without a little help from you, your friends might spend the evening talking to their friends or significant other without getting to know new people. 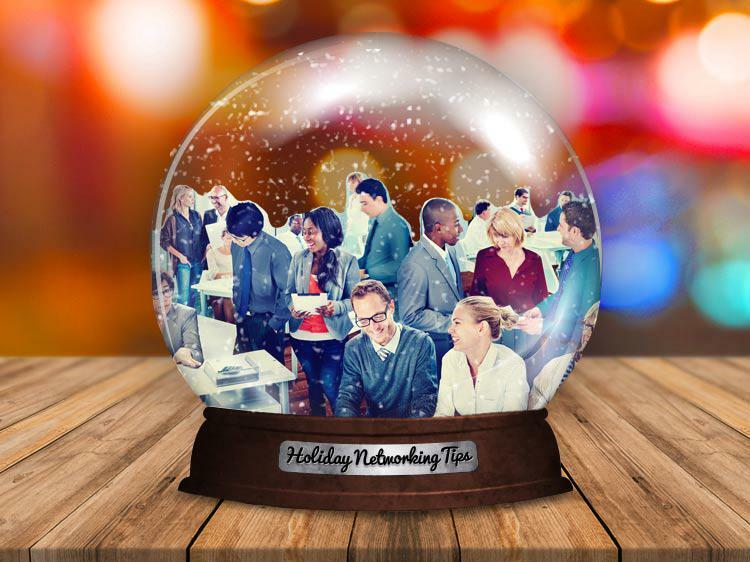 (As Drake would say, “No new friends.”) Be a helpful networking elf and find ways for them to mix and mingle. “Pre-match people or send out the bios of the guests before the event,” says Emily Merrell, founder of the New York City-based networking group Six Degrees Society. “I've found that offering a jumping off point when meeting someone, whether personal or professional, can make all the difference from small talk to an authentic connection." Not all holiday networking has to be done at parties. When you’re sending letters to Santa, throw in a few holiday cards to reconnect with friends and former colleagues. “They will remember your thoughtfulness and maybe a new collaboration or job opportunity may come from it,” says Rachel Adujar, founder of the Maryland-based career coaching firm Rethink the 9 to 5. The main objective is to have an annual check-in with people who could be helpful personally and professionally. Who knows? With the right mix of holiday mixing and mingling, you may end up starting the new year with a new job. The holidays are a great time for making contacts, but there's plenty more things you can do year-round to bump up your professional profile. Could you use a little help in that area? Join Monster for free today. As a member, you'll get career advice, useful job search tips, and plenty more info from experts sent directly to your inbox. Learning to navigate the workforce at every stage of your career takes some insider know-how. Let Monster lend you a hand.